Learn the principles of success and how to apply them! But I coached her a bit and she went on the interview anyway, and called me a couple days later. She told me she was hired over people with many years of experience in this position. She started off as approachable. She was pleasant, she’d have a conversation and chat, then they’d ask her an important job related question and she’d switch into credible. She’d move into this place where she spoke with authority, power and conviction using these credible tones and gestures. They finished that question, and maybe there was a little pleasant “approachable” banter back and forth for a minute. then they’d ask her another question, and she’d move into credible. To make a long story short, she got the job. This is powerful stuff when you use it effectively. Use the skillset of presence. 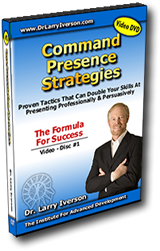 If you want to have a commanding presence, part of what you need to do is you need to read people, you need to determine are they a visual an auditory or a kinesthetic. You need to be able to move in and out of credibility and approachability. You don’t need to be one or the other you need both. It is normally best to start being approachable and friendly. They you move into credible. You can go back and forth (even fairly quickly) but keep the skillsets separate. There was a group of attorneys who were experts in using this strategy of credibility vs. approachability or charismatic. They went to law firms who were interviewing attorneys for positions. One group of the attorneys always acted only credible. A second group of attorneys who were applying for the job were always approachable. The third group was first approachable then credible. And the fourth group was always credible then approachable. Of those groups being interviewed, the attorneys who were first approachable then credible, got more than double the number of job offers, than all three of the other groups put together. So, first be approachable then be credible. Using these skills of influence and presence you can take your life to an entirely different level. What if there was a way that you could make persuasive presentations every single time? Whether it was to individuals or to groups. What if you could have that ideal relationship and have an impact and communicate in such a way that you absolutely made it overflow with good stuff? What if there was a way you could influence decision makers that could help your career go to the next level? What if you didn’t have to worry about money because you could boost your income by 50%, 100%, 200%? What if you could persuade other people to do what you want when you wanted them to do it? There is a way. You are learning it right now. The skills of command presence, of persuasiveness, of being able to influence, of being a great communicator are some of the best skills you can ever learn. Take the time to go over this program again and again and again! Use it. Think about it. Practice each of these skills. Get better at discerning what other people are doing. You can take these skills to a whole new level and apply them in your unique way to assist you in your personal and your professional life. Be proactive about using the skills of success. Learn these to fully develop the lifestyle you want. This concludes “Creating A Commanding Presence”. Please stay tuned next week for an all new program that can improve your relationships, your success, and your life for good! Has this program caught your interest? Perhaps you’d like to download the entire program to your phone or tablet and listen during your travels? You can purchase and immediately receive this entire program as a digital download.